Of course you probably haven’t! Unless you enjoy Korean food or are excited to try new things, this ingredient might be completely foreign to you. Let’s be honest, fermented cabbage doesn’t usually scream “delicious” if you haven’t tried it before. This is one of those ‘you just have to trust me’ kinda dishes. Kimchi is typically made with cabbage and daikon radish, but I’ve seen some varieties include a lot of other vegetables as well. Whatever. 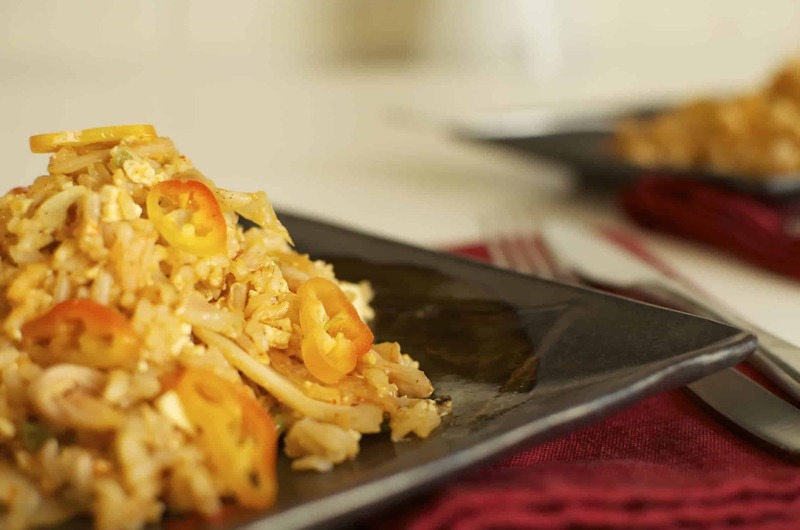 It doesn’t really matter that much which one you go with, but try to find a napa cabbage based variety for this dish. If you want to impress your friends and family. (“Who me? Fermenting cabbage on a school night? 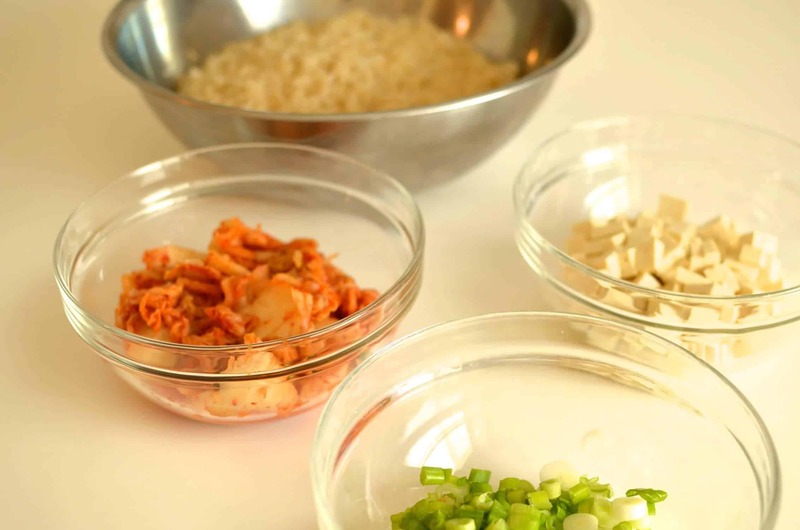 You don’t do the same?”) You can follow the tons of homemade Kimchi recipes available online. If you want to leave the fermenting to the pros, head to your local Whole Foods or Asian Market for a jar of it. In a large saute or wok, heat the butter over medium high heat . Add the kimchi and fry for 1-2 minutes, add the onion and garlic and saute 5 minutes more. Add the tofu and saute 2-3 more minutes. Add the rice, soy sauce, Sirarcha, scallions and cook until heated through. 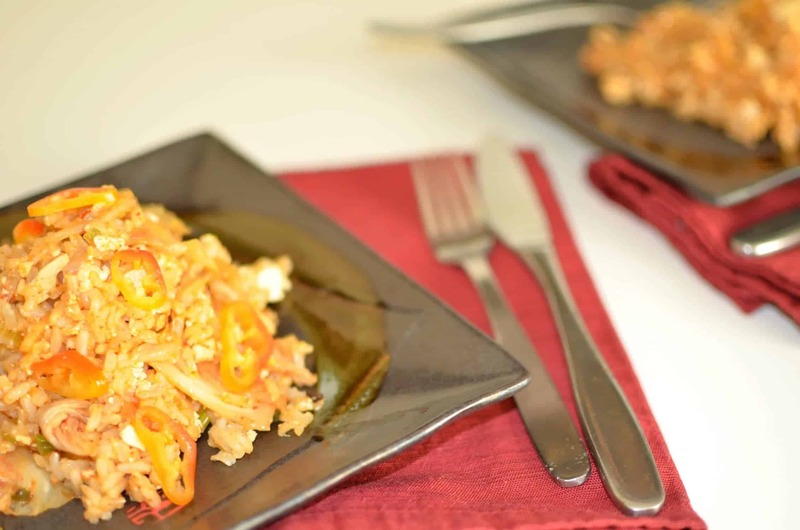 I love kimchi fried rice – great idea adding tofu for some extra protein! Kimchi is on my list of things to try. There are a few people in my office that munch it down regularly ..Im not such a fan of the smell 🙂 I suppose the health benefits would help me get over that. Must give this recipe a go-Thanks! I love fried rice. I love the additions you made to it. It looks yummy! Kimchi is one of those foods I keep hearing about but haven’t tried yet. Now I have no excuse! Thanks for the recipe. Kimchi’s great…but it makes you stink if you eat too much of it. Cabbage, in general, is way underrated. Great shots! Your killin’ it with the camera these days! I love all the different colored backgrounds and the nice bokeh. I love making kimchi! I’m always looking for new ways to use it. Someone suggested kimchi quesadillas?! I will have to add to fried rice! Interesting, I never would have thought of that but sounds great! I made this dish a few times while testing it and each time I enjoyed Kimchi more and more. I will have to start adding it to more foods. Thanks! 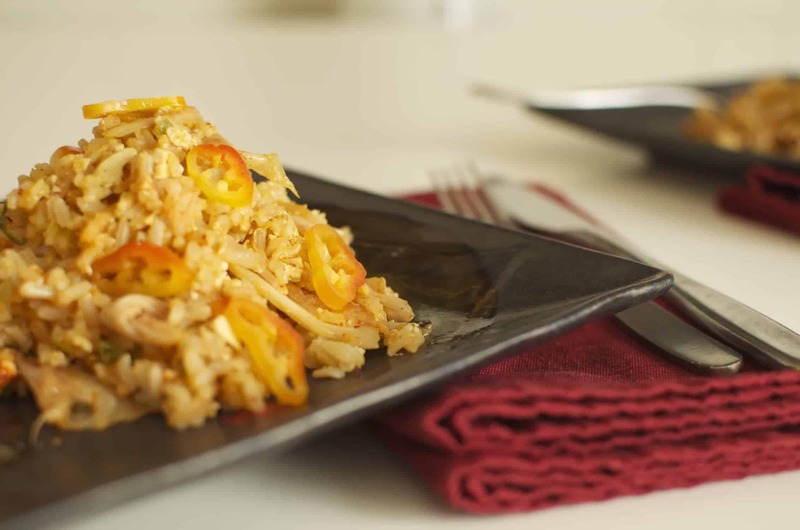 Have never had kimchi fried rice or even considered it till reading your post. Love how this challenge expands our food world, don’t you? Yes! Completely agree! I love going outside my “normal” food world with these challenges. Thanks for commenting.